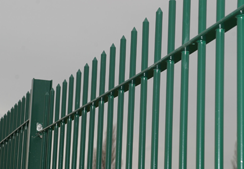 Peart Fencing’s railings are available in a wide range of specifications to suit all site conditions. Our metal railings can be designed specifically for your taste, or your business needs. State-of-the-art manufacturing capabilities provides the versatility and capacity to accommodate difficult site conditions such as raked panels, posts with base plates for bolting down concrete, cranked posts for fixing over walls and posts designed to allow stepping. Peart Fencing manufacture bow tops, blunt tops, pointed tops, finial tops, or dome tops with many other alternatives specifications available. Please contact the estimating team on 01429 852 352 with your enquiry. If you have any questions about our railings, please don't hesitate to contact our estimating team on 01429 852 352. Alternatively, you can receive a quote via our online quotation system in addition to speaking directly to our estimating team. Bow top & vertical bar railings turn a security fence into a decorative and attractive feature. The range of designs available make them the ideal choice for schools, parks and residential areas. Railings are available in standard size panels or manufactured to suit individual site requirements. As with all Peart Fencing Systems, railings can be polyester powder-coated in virtually any colour. Posts are available as rolled steel joists, hollow square section or tubular steel. Gates are designed to match the railings and are manufactured to order. The use of pointed tops is not recommended on railings of 1.8m high and below. Ornamental finials are available in a vast range of styles – information on request. Peart Railings are available in a wide range of specifications to suit all site conditions. State-of-the-art manufacturing techniques allow for the versatility and capacity necessary to accommodate difficult site environments, such as raked panels, posts with base plates for bolting down to concrete, cranked posts for fixing over walls and posts designed to allow for stepping. Bow top and vertical bar railings can transform a security fence into a decorative and attractive feature. The range of structural designs available make them the ideal choice for schools, parks and residential areas. Railings are available in standard size panels or manufactured to suit individual site requirements. As with all Peart Fencing systems, railings can be polyester powder-coated in virtually any colour. Posts are available as rolled steel joints, hollow square sections or tubular steel. Gates are designed to match the railings and are manufactured to order. Specifications are for general purpose only and may be changed to suit site conditions.